Peridot Earrings – These are Peridot green earrings set in sterling silver with a hammered finish creating radiating lines to the front and plain on the reverse. 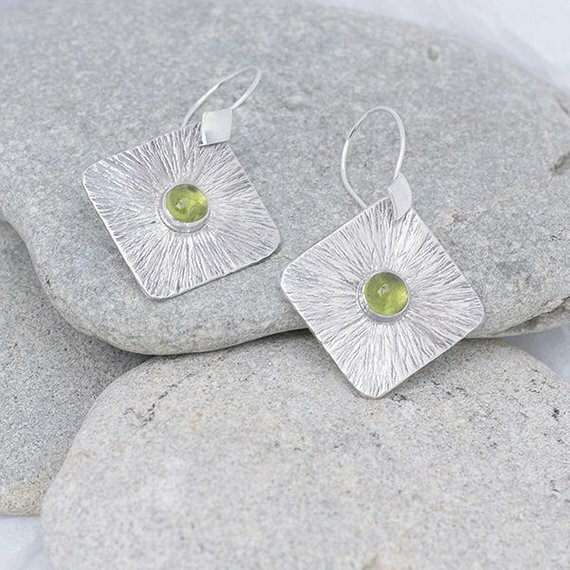 The Peridot gemstones are set in a collet of sterling silver. Each square earring has a subtle beveled edge which catches a glint of light defining the perimeter. The ear wires, also in sterling silver, chosen for aesthetic appeal and they allow movement of the earrings below. * Handmade to order – You’ll receive your own pair, like those shown in the photos. * Boxed, ready for gift wrapping. We enclose a card with a message upon request.